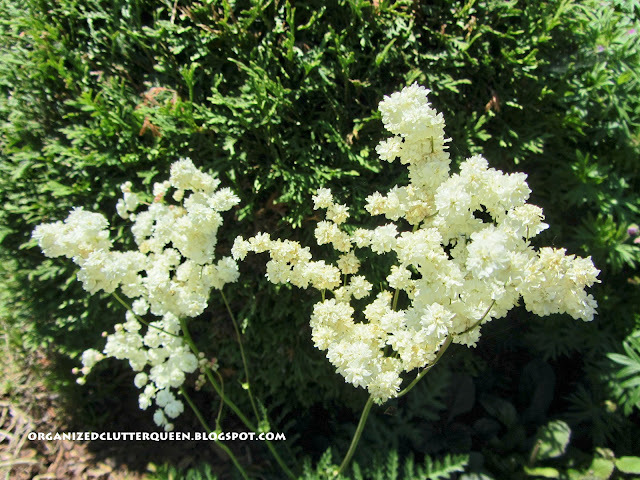 White and red astilbes are in bloom. That's perennials just coming into bloom. Last year my son was going to tear down an old tree house in the woods on his property. I asked him for the ladder. A couple of the bottom rungs were pretty rotten, so they were cut off. 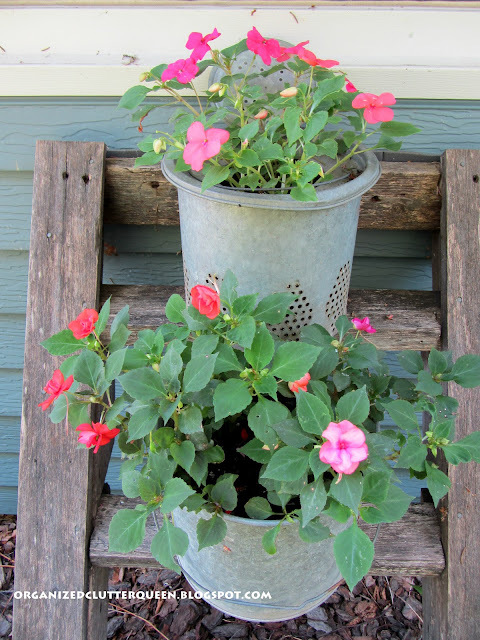 This is a shady area that I have impatiens planted in a minnow pail and the minnow pail insert. 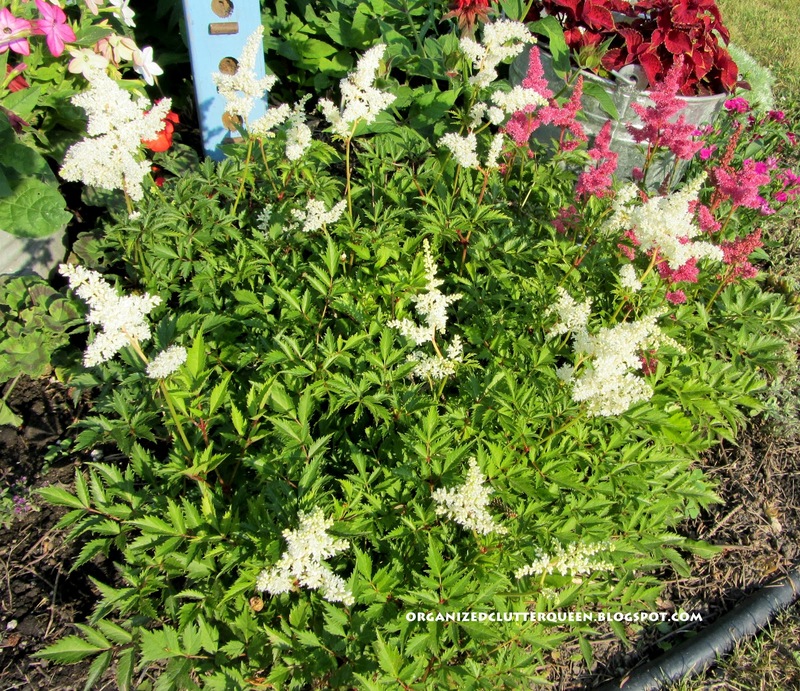 (remember I love planting in galvanized) The ladder is surrounded by spirea, also in bloom. A divided, galvanized seed/tool tray planted with alyssum, and my terra cotta painted bunnies from Target this year. This is the left side of the my fairy garden. I have planted an ornamental oregano for the first time. I love the pink tinged blossoms hanging over the side of the half barrel. 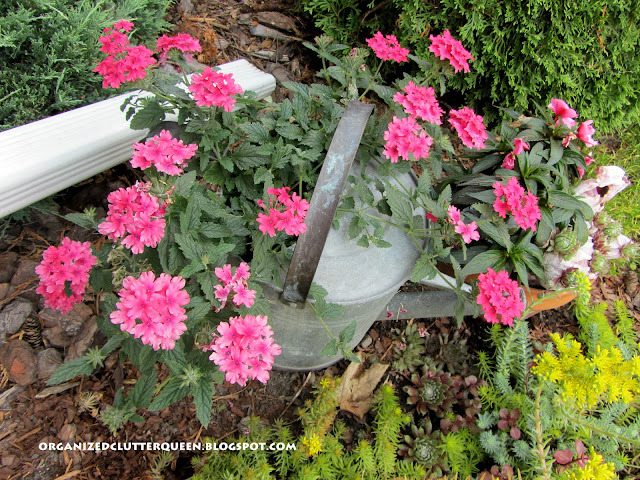 And finally, a rosy pink trailing verbena in a watering can that also made it through the caterpillar attack. Looking good! 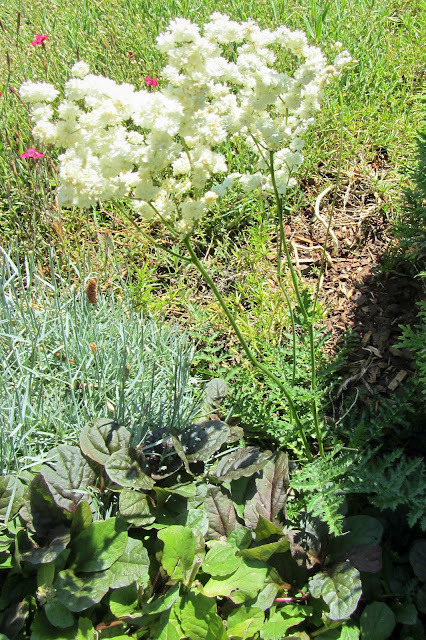 I love the flower garden successes! Your garden is a treat! I love all the extra touches you add among the beds for visitors to get an added surprise. 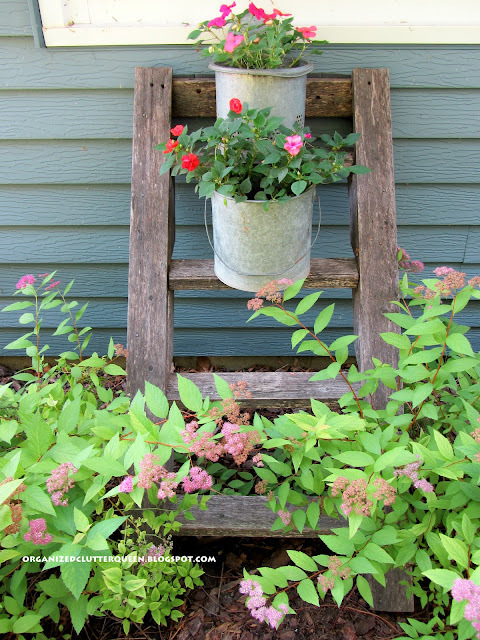 The ladder and bait buckets are great, but the watering can is my favorite. Thanks for letting us roam in the garden with you! Love what you did with the ladder! Question - when you plant in galvinized steel/metal do you punch tiny holes in the bottom for drainage? Yes I use a nail and a hammer and make a few holes! 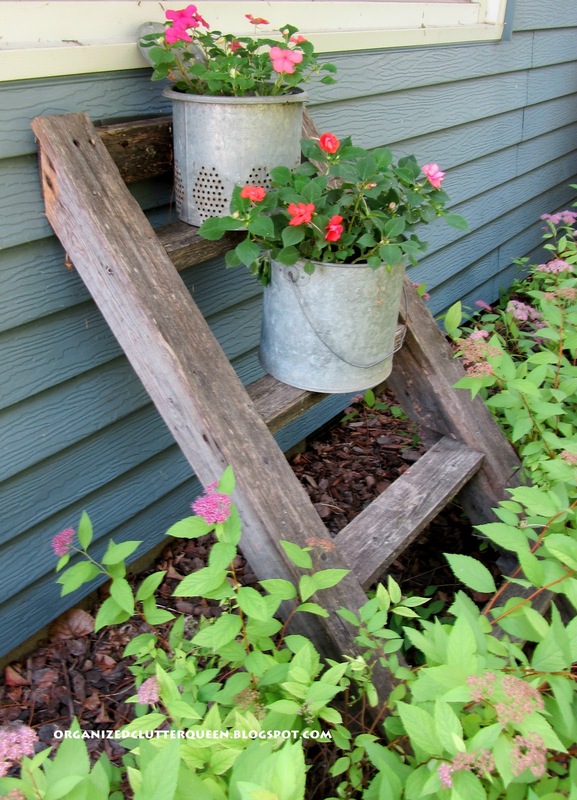 Love the ladder and your galvanized pieces! Oh and of course all your flowers! 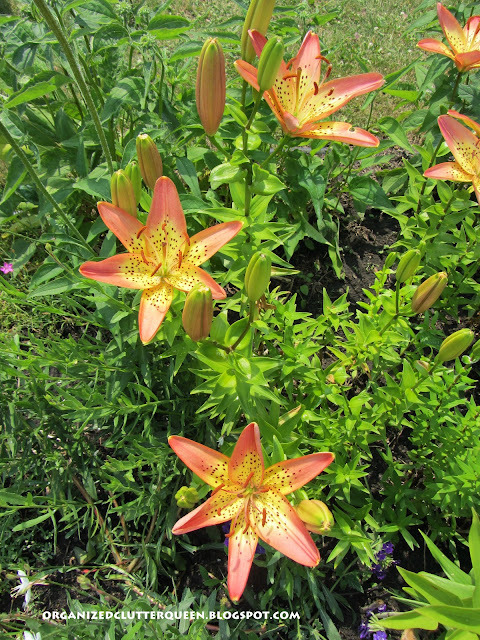 I had orange, white and burgundy lilies bloom this year! And one of my daylilies in back is blooming burgundy too! Knock wood, so far the bugs have only eaten my marigolds this year. I have never had that happen before! Thanks so much for the tour Carlene! Beautiful flowers! I love the minnow pails on the ladder. So cute! 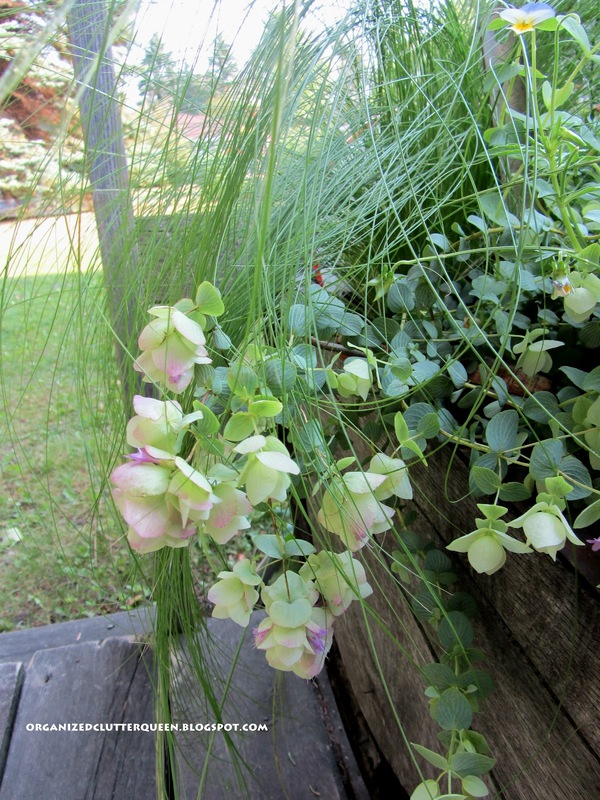 You certainly have a green thumb! It's all so beautiful! what a pretty garden, and love the little bunnies. Your flowers are looking great and everything looks so healthy. Love the new blog banner photos, too! Everything looks so pretty -- those blue chips campanula are my favorite!! There is a neglected park/pond near where I work and everyday for my break I walk over there and there are tons of these. I didn't know what they were and I've been trying to figure out how to get some seeds from them to plant in my yard for next year. Love your little ladder too! 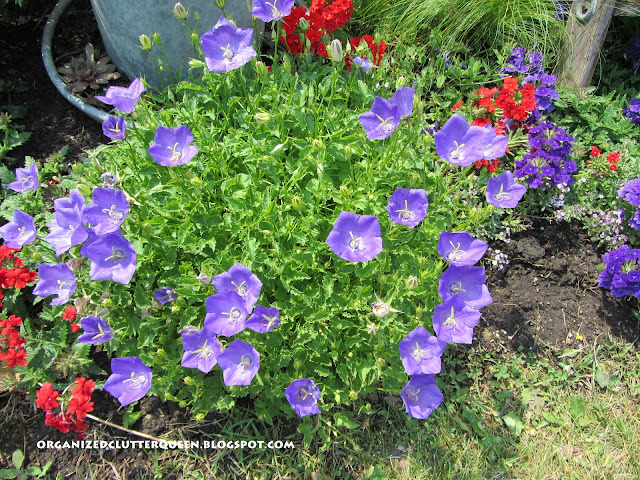 Your flowers and garden is beautiful! I'm almost green with envy! Thank you for sharing your creativity at Potpourri Friday! Your flowers are looking beautiful! I love the little ladder, it makes a cute plant stand. I've never seen ornamental oregano, it's really pretty! Lovely flowers and so very cute projects. Thanks for sharing your lovely garden. Your flowers are beautiful! I especially love the ladder you are using - what a great save!